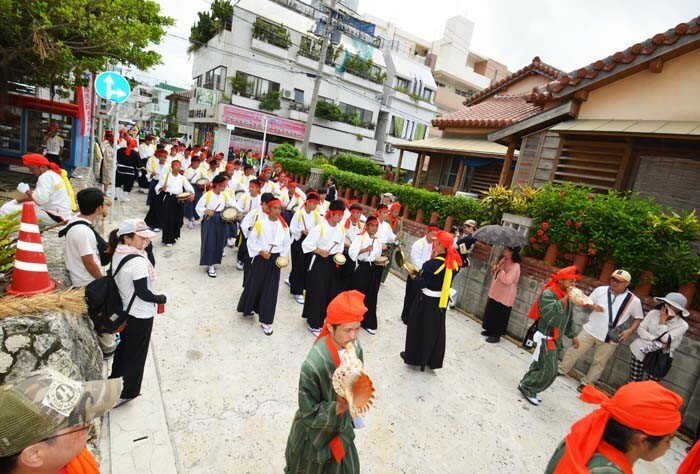 Yonabaru tug-of-war is the first of the three giant tug-of-war festivals held annually on Okinawa. The 34th Yonabaru Great Tug of War Festival takes place Saturday and Sunday, July 30th and 31st, at the Yonabaru Udunyama Youth Field. 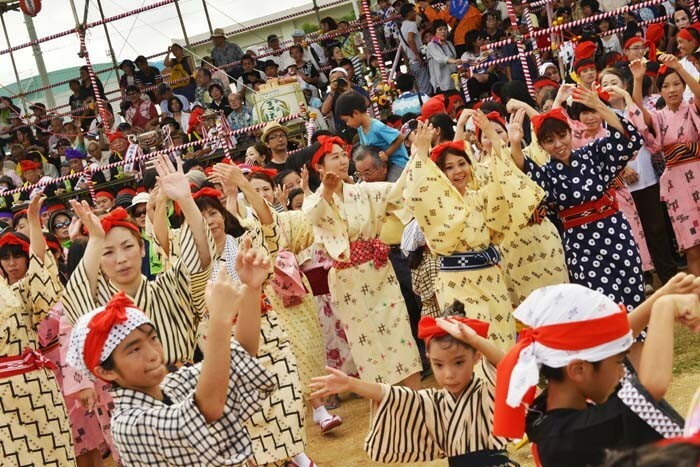 The main event, the Yonabaru Great Tug-of-War takes place Sunday afternoon, while Saturday, is mostly dedicated for usual Okinawan Festival activities of eating, drinking and having fun at the food and game stalls on the festival field. Hatagashira performance is the favorite of local young men. Yonabaru used to be the main port for transporting goods between the island’s northern parts and main cities in the south. Before the war, a narrow-gauge railroad connected Yonabaru and Naha. The festival starts with a children’s parade at 10:00 on Saturday, while the official opening ceremony takes place at 15:00. Street dancers, children’s taiko group, Lequios Band and Hawaiian dancers provide the rest of Saturday’s entertainment. 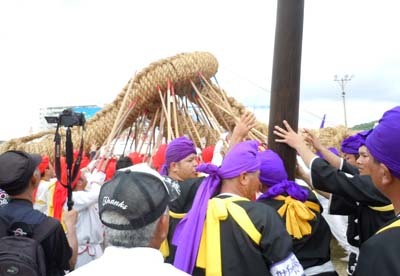 On Sunday, a procession called ‘Michijyune’ leading up to the Tug-of-War that includes a sacred ceremony for a good harvest and is an important part of the event, starts on Route 329 at 15:50. The actual Tug-of-War begins at 17:00. 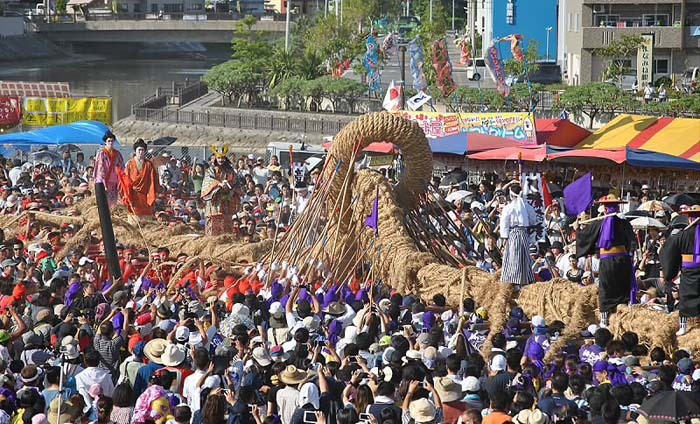 Local residents participate in making the big rope from rice straws and then carry it to the venue. The rope is 90 meters long and weighs about five tons. 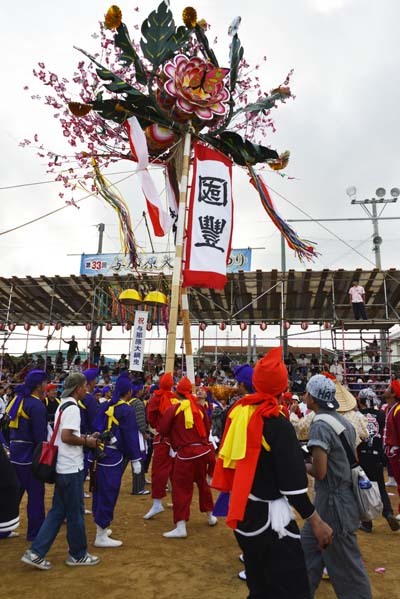 On the big rope, seven people called ‘Shitaku’ dressed up as historical characters from the history the Ryukyu Kingdom accompany the rope to the field where the tug-of-war starts. A large log is used to tie the two halves of the rope together. The two teams then try to move to rope about five meters to their respective direction. The longest the contest has taken so far was 15 minutes and the shortest only five. Admission to the festival, which boasts 440 years of history, is free. The festival grounds are open 10:00 ~ 21:00 on Saturday and 09:00 ~ 21:00 on Sunday. Free parking is available at temporary parking areas on the prefecture-owned land next to Marine Plaza Agarihama, Agarihama Baseball Field, Yonabaru Elementary School, Yonabaru Chamber of Commerce, and Uenomori Park. A video on the procession is and an English language website of the festival have more information. The main part of the festival takes place at Yonabaru Udunyama Youth Field. Local women dance during the Michijyune Parade.